Kevin Weinheimer and Terry Weinheimer of the Weinheimer Group, are wood floor experts. These experts specialize floor failure analysis of hardwood flooring. Through onsite inspection, testing and review of documentation and research they determine failure cause. Not all floor failures are the same. Some failures product related, others, installation or site related. Occasionally, we find multiple causes of a flooring failure. Regardless, determination is made based on facts and not opinion. Hardwood floor, engineered wood, bamboo flooring, exotic wood floor, laminate or other flooring product or installation. NWFA Certified and licensed flooring inspectors Terry Weinheimer and Kevin Weinheimer are a phone call away. When in need of a wood floor expert to solve and analyze a problem, think Weinheimer. Weinheimer experts are backed by years of floor covering failure analysis and inspection experience. Terry Weinheimer was trained by NOFMA the Wood Flooring Manufacturers Association. Terry was the first inspector in the Pacific Northwest to become an NWFA Certified Flooring Inspector. Kevin Weinheimer attended the first certified inspection class held in the Pacific Northwest. Kevin was to later join Terry as a NWFA – National Wood Flooring Association, certified and licensed inspector. There is a variety exotic and domestic wood floor and bamboo species. There are also many wood floor manufacturing techniques. These techniques deal with products from solid wood flooring to engineered floors and laminated wood floor. They involve installation methods such as nail down floors, glue down floors and floating floors. One can only imagine the number of concerns that can be addressed by wood floor experts. There is also a large variety of flooring issues. Gaps, cracks, noise issues, cupping, buckling, delamination, lifting, denting, scratching, finish problems, moisture related and grading issues to name a few. Weinheimer wood floor experts will perform thorough analysis and testing to identify the cause of your flooring failure. Upon completion of the investigation and testing Weinheimer wood floor experts will provide you with a written report and the supporting documentation. Weinheimer Group wood floor experts provide inspections for a variety of clients. Building owners, home owners, installers, attorneys, flooring manufacturers, retailers, distributors, architects, builders, developers and insurance companies. We are independent experts – problem solvers, not hired guns. If you want to prevent or are involved in a law suit, the flooring consulting services of The Weinheimer Group will be of great assistance. 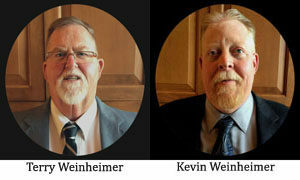 Weinheimer wood floor experts, Terry and Kevin Weinheimer. Terry’s experience as a floor covering inspector began more than 40 years ago, and Kevin has been inspecting floor coverings for nearly 20 years. The Weinheimer Group has been providing flooring inspections in Oregon since 1990 after relocating to Oregon from Southern California. The flooring industry continues to introduce new products and even with their many years of experience Terry and Kevin invest heavily in continued education to remain current on these changes. In addition to being wood floor experts and certified wood floor inspectors, Kevin and Terry are experts and hold certifications for inspecting other flooring and floor covering products such as laminate and bamboo floors, resilient floor covering, cork floors, carpet and specialty floor coverings. The Weinheimer Group Inc is a member of and holds certifications from a variety of industry organizations. WFCA- World Floor Covering Association, NWFA – The National Wood Flooring Association, CFI – Certified Flooring Installers, NICFI – National Institute of Floor Covering Inspectors, FCITS – Floor Consultants and Inspection Training Services, AFS – Advanced Flooring Specialist and others. The Weinheimer Group provides both residential and commercial flooring inspections. From service locations in Eugene and Portland, Oregon and Tacoma, Washington, we provide service throughout Western Oregon and Western Washington. Nationwide service is available. When you have a wood floor or other flooring issue and need to consult with wood floor experts, contact Terry or Kevin Weinheimer for information, consultation or arranging an inspection. Phone us at 800.621.3427 or use our Contact Form.